Basketball players are more prone to Achilles tendon injuries than other athletes, as Kobe Bryant, Dominique Wilkins and Chauncey Billups might tell you. In fact, a large number of NBA players were never able to return to their sport as a result of this injury. An injury to the Achilles tendon results in pain and tenderness at the back of the heel, along with swelling, bruising and decreased range of motion. An Achilles tendon tear is one of the most painful orthopedic injuries. Unfortunately, it is also one of the most common for basketball players, both amateur and professional. The good news is that you can take proactive steps to avoid this painful injury both on and off the court. The Achilles tendon is the longest, strongest tendon in the body, extending from the bones of the heel up into the calf muscles. This tendon allows you to point and flex your foot and push off the floor. 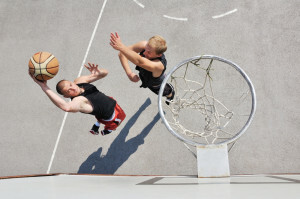 For basketball players, it contributes to stability, explosive motion and quick directional changes. This tendon endures stress equal to 10 times your body weight. Almost three-quarters of all Achilles injuries originate from playing sports, and almost half of those are attributed to basketball players. An Achilles tendon injury may be diagnosed as either tendinopathy or a full tendon rupture. Tendinopathy, also known as tendinosis, refers to inflammation or tiny tears in and around the tendon. It develops over time from overuse and repeated movements. In contrast, ruptures occur suddenly as a result of direct trauma to the lower leg, foot or ankle, or some type of forceful motion that is greater than the tendon can withstand. Some patients compare the sensation of a rupture to being shot in the back of their ankle. Although you may be able to hobble or even walk after an Achilles tear, you will lack the ability to push off with that foot. Athletic footwear that fits correctly is a major factor in preventing tendon injuries. Of course the reverse can be true as well, with improperly fitting shoes contributing to potential damage. Choosing appropriate footwear isn’t just about finding shoes of the right size and width. To help prevent injury, shoes must have the correct arch and appropriate cushioning or support for your foot type. Shoes should bend where the foot bends and provide effective heel cushioning. Consider having your feet professionally evaluated. This can help you select the best athletic shoes for avoiding orthopedic injury. To avoid Achilles injuries, never participate in any sports or intense activity unless you have the proper training and conditioning. Daily stretching exercises will strengthen the muscles that support this part of the foot, as will pre-game stretches. An effective daily strengthening routine might include a few minutes of walking or biking, along with calf raises and plantar fascia stretches. At the gym, try standing and seated calf raises, heel drops and a leg press with moderate weight. Cool down after the game with stretches and a little light jogging, walking or biking. If you are experiencing pain or other issues with your feet or ankles, schedule a consultation with the experienced orthopedic and sports medicine physicians at Steward Health Care: Centers of Orthopedic & Sports Medicine in West Jordan, Utah. Don’t let an Achilles tendon injury put you on the bench! This entry was posted in Sports Medicine, Foot & Ankle, News on December 3, 2015 by admin.